Summer time is here and with it comes some of my favorite cold desserts! Today I’m bringing you a brand spanking new freezer pie that I know you’re gonna love. Seriously, you are going to LOVE this pie! A while back I posted a sneak peek for my book and featured the cover, which was shot on location in Birmingham in the home of the extremely kind and generous Mrs. Sandy Deaton. Thanks again, Mrs. Deaton, for letting us use your porch and for entertaining the kids! Well as it turns out, Mrs. Deaton is no stranger to feeding folks herself and her daughter, Ashley Deaton McMakin owns an award winning catering company in Birmingham, Alabama. Ashley Mac’s began as a hobby venture and has expanded to serve both private and corporate functions in addition to their walk in storefront! 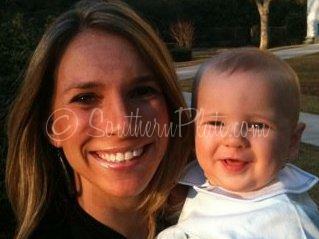 That is Miss A shley pictured with her beautiful baby. Can’t you just look at that photo and tell what a sweet and gracious person she is? She was kind enough to share one of their popular recipes, Ashley Mac’s Coconut Caramel Pie, with all of us today. You’ll be surprised at how easy this is to throw together. The great thing is that this is a pie served frozen that makes two, so eat one now and save the other to pop out of the freezer and impress your guests the next time they happen by! Don’t ya just love it when life gets easy? You’ll need: butter, coconut, chopped pecans, cream cheese, sweetened condensed milk, whipped topping, and caramel topping. So if you are just now catching onto the fact that this isn’t a health food, welcome to the room and pull up a fork. The rest of us got excited right around the mention of “sweetened condensed milk”. Just for kicks, I got “lite” whipped topping though, mainly just because that is how my sense of humor works. You’re also going two need to deep dish pie shells, already baked. You can make your own if you like but I went the easy way out for this one. You know what, I think I’m gonna switch horses and use sweetened shredded coconut in this. Now set that aside to cool a bit. 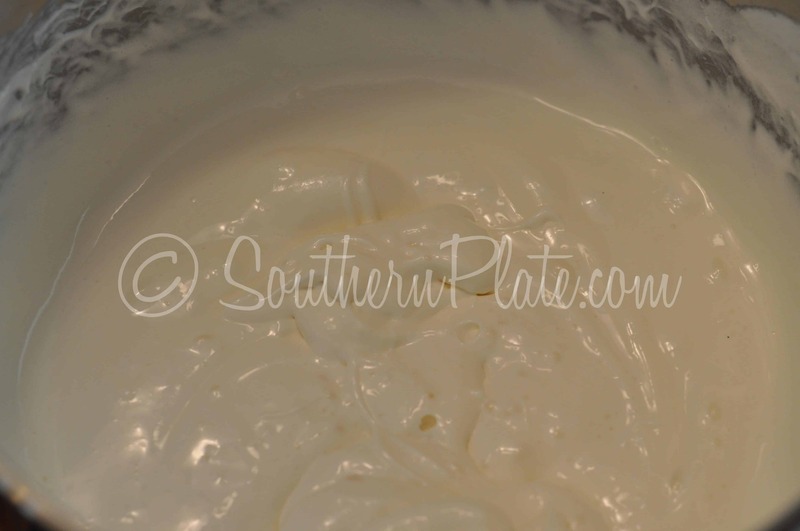 Place your room temperature cream cheese in a bowl along with your sweetened condensed milk. Dump in your whipped topping.. Okay so the instructions said to “fold” in but the minute whipped topping hops into my buggy at the grocery store is the same minute it should just resign itself to a fate of being dumped. So I dumped and then used my electric mixer again to get it all smooth and well blended. Ashley’s directions say to drizzle caramel over the top. Now you can look at that photograph of Ashley at the top of this post and just see how graceful she is. I imagine drizzling comes second nature to her. When it comes to me, though, I sometimes have all the grace of a mad bull in a china shop. My drizzling just turns right into globbing. 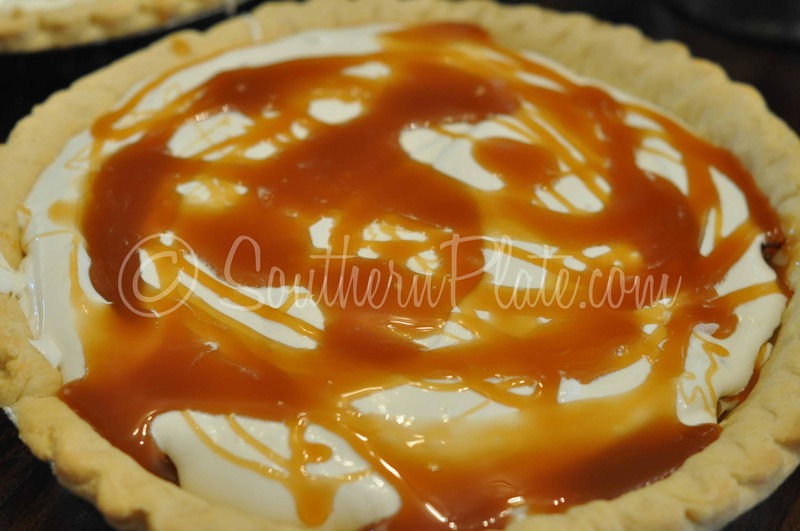 Glob or drizzle, just put some caramel over the top however works best for you – about 1/4 of the jar for each pie because we’re going to repeat these layers. 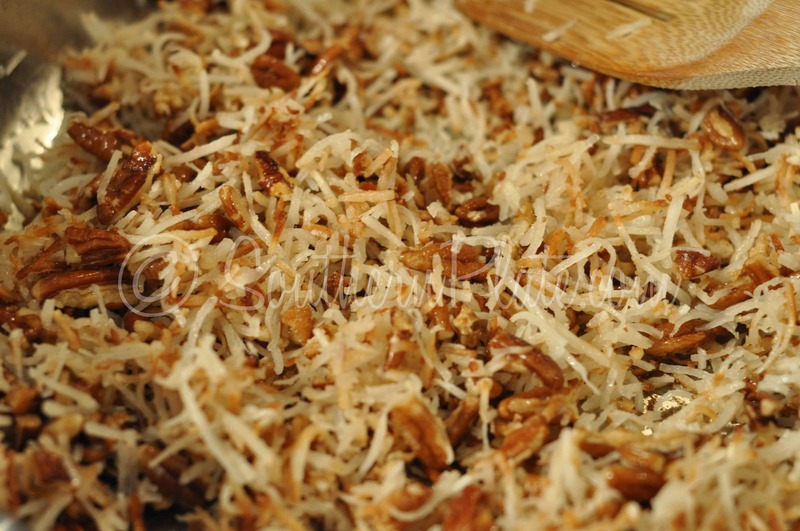 Top each with 1/4 of the coconut pecan mixture. 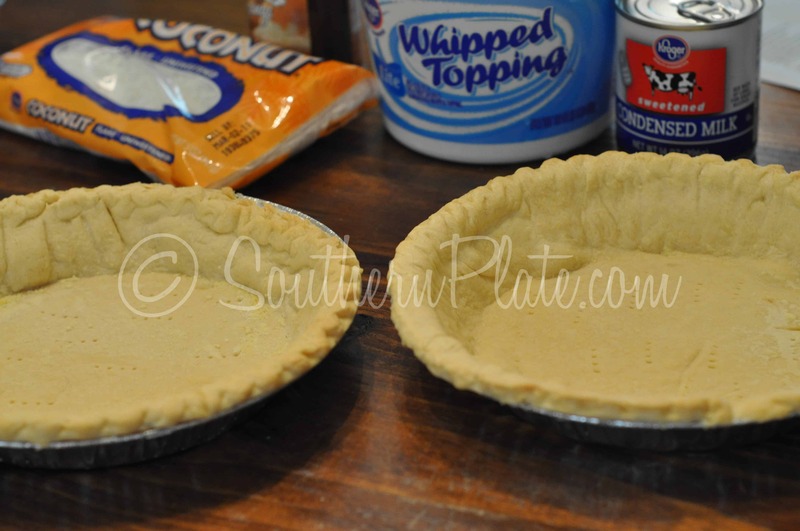 Now your pies are done and ready to freeze before serving! Place in freezer (you don’t have to cover them right now, you can do that after they are frozen) and freeze until solid. Call your honey and let him or her know not to be late for dinner! 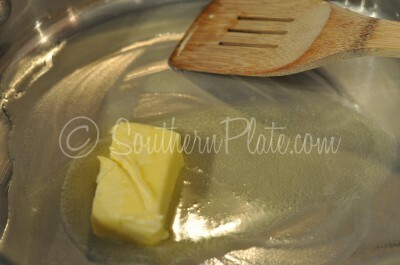 Melt butter in a large skillet. 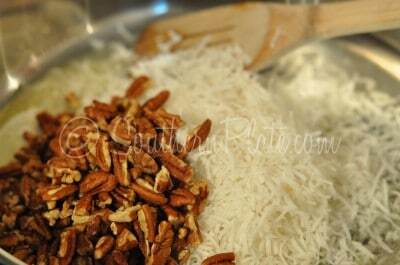 Add coconut and pecans. Cook until brown and set aside. 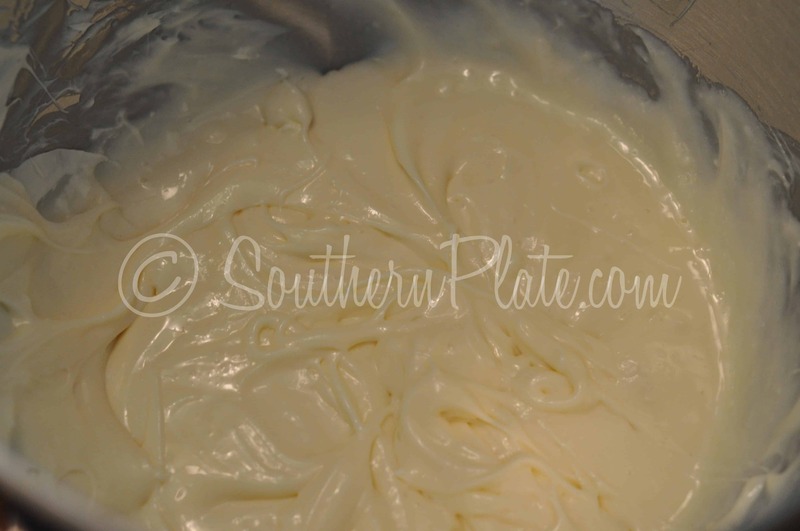 Combine cream cheese and sweetened condensed milk in a mixing bowl. Beat with mixer until smooth. 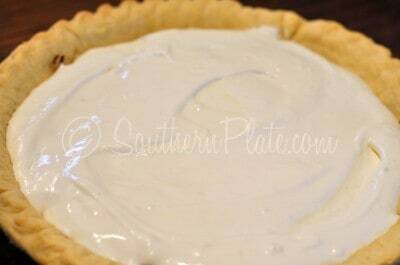 Layer ¼ cream cheese mixture in each pie shell. Drizzle ¼ jar of caramel topping on top of cream cheese mixture in each pies. Sprinkle half coconut mixture on top. Repeat the layer, beginning with the cream-cheese mixture. and humble enough to backtrack. Submitted by Sue Yowell (thank you, Sue!). Submit your positive, humorous, or uplifting quote by clicking here. All Purpose Marinade – Chicken, Steak, Burgers, and Veggies! Oh Dear Lord – this looks delicious! Like a pie my granny would make – except she’d have to make three to feed her twelve kids! MARLENE – BEST OF LUCK WITH YOUR TREATMENTS, JUST KEEP THE FAITH AND YOU’LL BE FINE. I’M SURE THE PIE WOULD HELP TOO. SORRY YOU’RE SO FAR AWAY OR I WOULD MAKE YOU ONE!!! Marlene, my mom was diabetic too and I cooked for all the time. Had her on a low carb diet that kept her bgl (blood glucose levels) down nice and low. 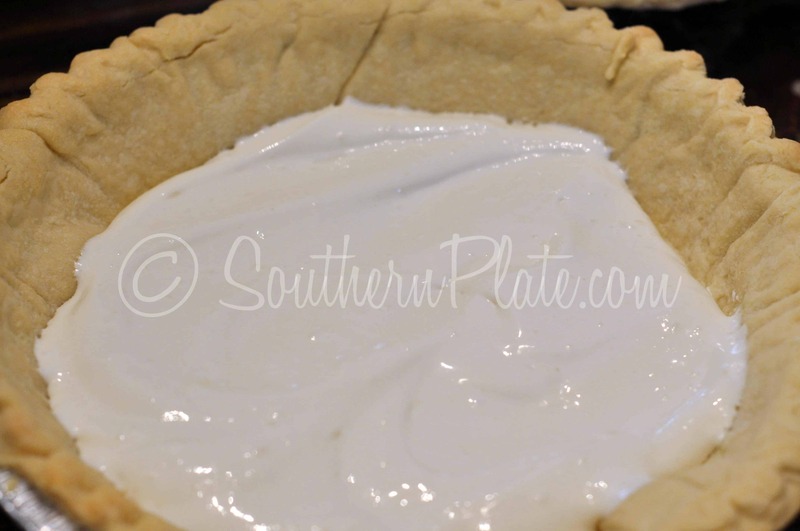 For this pie, you could easily make a nut crust ( grind up whatever kind of nut you have at home and mix like you would a graham cracker crust with butter and a little splenda (whatever sweetener you prefer). Buy unsweetened coconut which is high and fiber and pretty low in carbs but high in flavor. 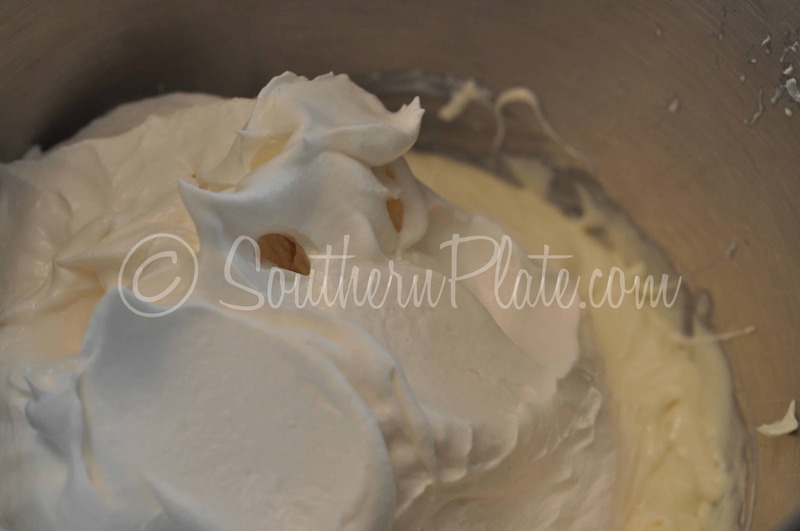 Use heavy cream with a bit of sugar free pudding mix beat into it for the condensed milk and whip your own cream. Waldens makes a pretty darn good sugar free carmel topping or you might find one at the grocery store. I got mine at http://www.netrition.com they have good prices and a flat 4.95 shipping rate. It wouldn’t be the lowest carb thing you could eat, but it is a treat not something you would make every day. Btw the carmel topping that walden makes, is pretty darn good to dip apple slices in, which is what I bought it for so mom could have a quick and easy dessert when she wanted. Hope that helps, have a wonderful weekend and God bless you, diabetes isn’t always the easiest thing to deal with. I know I’ve since developed the beginnings myself. It’s rampent in our family, not many people older than me that doesn’t have it. But I’m keeping it under control so far. Looks sinful! I wonder if it would be way to rich to make it in a graham cracker crust?? I’M PRETTY SURE I HAVE HAD IT IN A GRAHAM CRUST BEFORE. 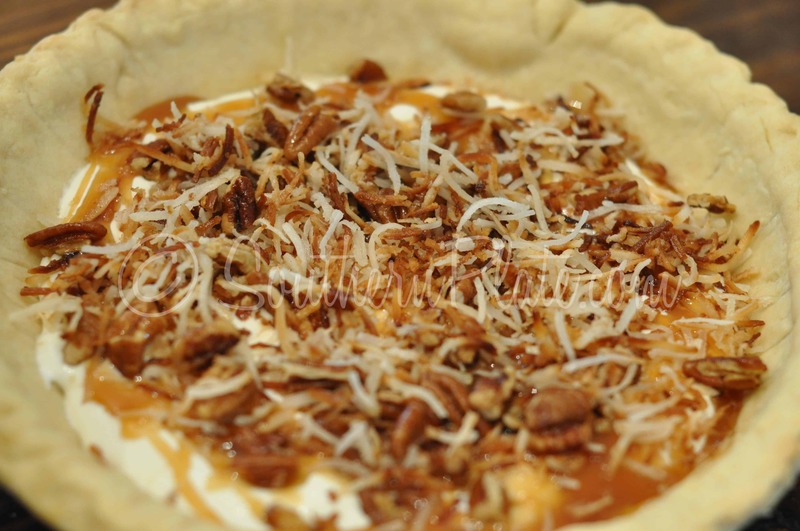 DON’T WORRY ‘BOUT THE CRUST, HONEY – THE PIE IS SO DELICIOUSLY, CREAMY RICH, YOU’LL NEVER NOTICE THE CRUST!!! Amy, I’ve been making this pie for several years now, and I always use graham cracker crusts. A plus for using graham cracker crusts (bought in store) is you can use the plastic shell part as the cover–just flip over. 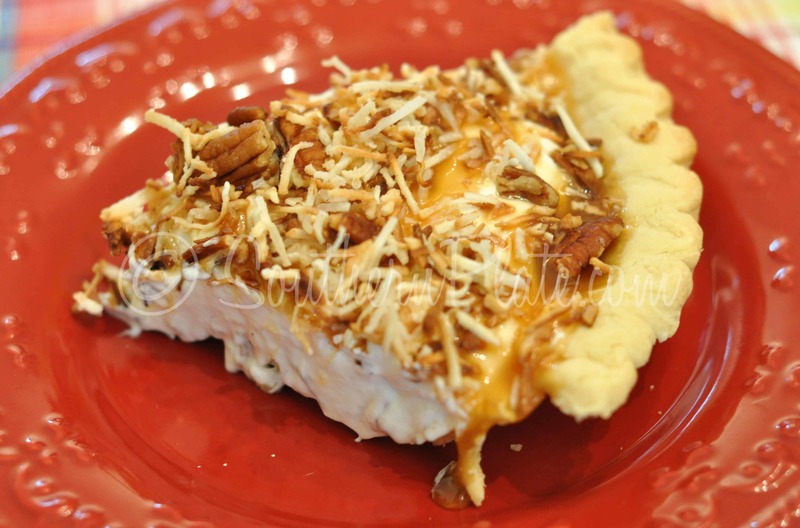 My recipe for this pie says to remove from fridge 10 minutes before serving. Very rich pie, but everyone I’ve serve it to loves it. 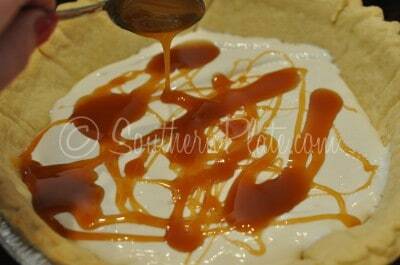 By the way, I drizzle some of the caramel topping over the top of pie before freezing. Good for you to read labels. Have you read the label on the condensed milk can? There are just too many bad chemicals in processed foods. 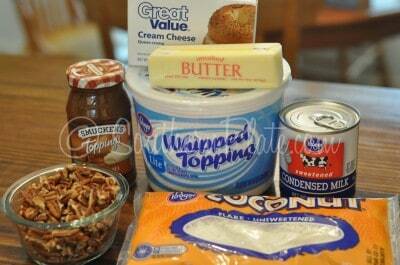 I will try to make this pie using organic ingredients. It does sound really good. Vicki, I hadn’t until I just looked it up online. It doesn’t look horrible, but I don’t know what vitamin A palmitate is and might not want to! lol I started making a lot of things from scratch (no more cream of mushroom soup, etc) so I could know and control what we’re ingesting. I had no idea it could be so easy to make these adjustments! I’m not a nutjob about it, but I do try to make adjustments where I can. All the health problems our nation has these days I figure it can’t hurt to get away from what processed foods I can. Let’s report back our outcome if we make it, should be interesting! I should add what I looked up was Eagle Brand lowfat, the regular is only 10 more calories and ingredients “milk, sugar”. LOVE this pie!!! and Ashley’s husband is from Huntsville. His mom, Kathy, is president of the Martha Pullen company, who has the School of Art fashion twice a year with people coming from EVERYWHERE to sew the most beautiful things. I know you also like to sew! Sewing & eating–what a great combo! We live right outside of B’ham and my aunt had this pie at an office party most likely catered by your new friend. I don’t know if she asked for the recipe or just figured it out, but when we visit them I always enjoy finding one hidden in the freezer. This is one great looking pie, my key board is awash in drool. I will be making this for the next family get together. We do our birthdays in groups and the next group will be celebrated in August and this will hit the spot in the hot month of August. OH! MY GOSH! (Yes I had to write it out!) This sounds soooooo good! Can’t wait to go to the grocey store and buy the stuff and make it and EAT it! Thanks for a great way to start a week end! Wow this looks good!! You think it would be OK without the nuts though? We (meaning me and the twins) aren’t nut people… Love ya sweetie and miss ya lots!!! Oh my God, this looks so GOOD! I’m going to have to run out to Aldi and get the ingredients I don’t already have. This sounds like just the thing to beat this Texas heat! I love Southern Plate…and Christy, too! OH YEAH – THIS IS A FAVORITE IN OUR FAMILY. I FIRST HAD IT SEVERAL YEARS AGO AT MY HUSBAND’S FAMILY REUNION. IT IS DEFINITELY SINFUL!!! This is a great recipe – I have one similar that calls for 2 packages of cream cheese and also uses hot fudge sauce “drizzled” along with the caramel sauce. It is called Summer Sundae Pie. And I think making it with “real” whipped cream and in a graham cracker crust would be D.I.V.I.N.E.!!!! Oh, my in-laws are going to LOVE this one! Of course, so will my kids, husband, and ME! 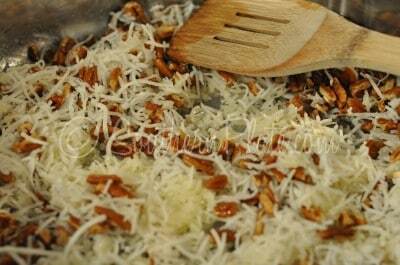 This has the same basic ingredients as the in-laws favorite cheese cake, AND coconut and nuts, so they’ll be crazy about this. I’m making it as soon as we finish off the carrot cake. Christy can I send you the anticipated hospital bills I am going to run up from recipes like this? 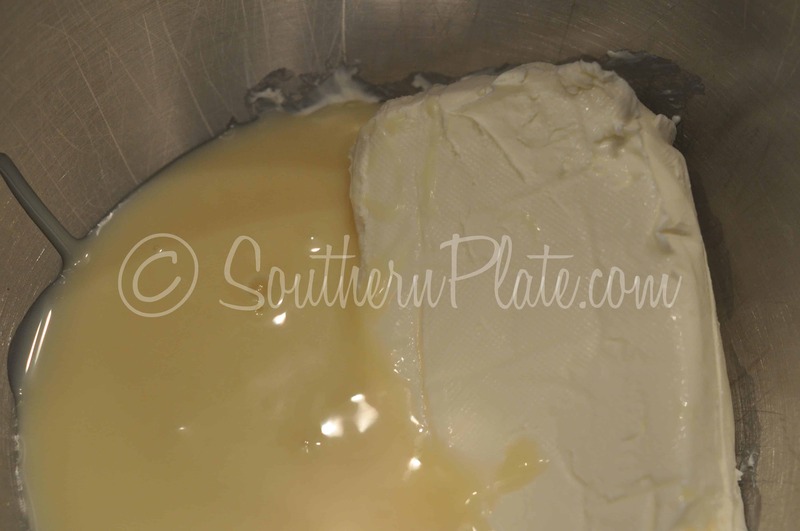 It is so incredibly simple, not cheap but it’s the simplicity that amazes me about most of the recipes I read……..and ohhhhhhhhhhhhhhhh soooooooooooooooooooooo goooooooooooood!~! I am a new subscriber but I’m loving your recipes and down home cooking. You are making the same recipes I grew up on so I feel like I’ve discovered gold when I found your website and wonderful recipes. I’ve already made several things like your strawberry cake which was scrumptious! 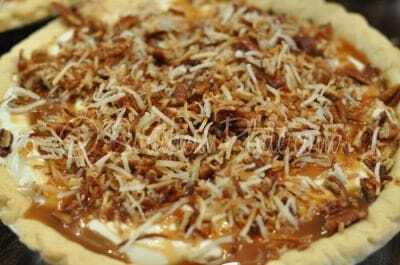 This coconut pie looks fantastic and I’m already thinking of new versions like making one of the layers chocolate! I love getting new recipes in my email and especially reading your funny comments as you explain each step. You are soooo refreshing! 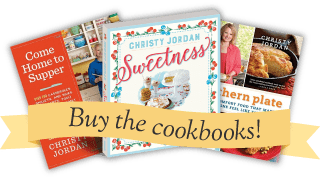 I’m looking forward to many more great recipes and especially your cookbook! Thanks a bunch!! I make this but we call it “oh God Pie” because when you take a bite you say “Oh God that’s good!” But we use a graham cracker crust, and leave out the coconut because the folks in my house “got dropped on their heads as kids”! WOW! I had to take more insulin just reading this! I can’t wait to try this on my friends and family….that’s so funny about the “lite” whipping cream when including condensed milk, but sounds like what I would do…sorta like getting a diet drink to go with the hamburger and fries…. Thanks so much for all the wonderful, simple recipes and the postings that accompany them, makes a day brighter…. Oooh that looks tasty, doesn’t it? Mmmmmm. I’m going to have to imagine eating it because my dude hates coconut and pecans and making a pie (or 2!) just for me would be a bad idea. Wonder if there’s anything I could substitute for the pecans and coconut… Maybe I could just make 1 pie and make half of it like the recipe says and just sprinkle mini chocolate chips or chopped peanut butter cups or broken up graham crackers with hot fudge sauce on the other half for Mr. Picky. I have friends that don’t like coconut (which makes no sense to me). The cream cheese filling really is like a frozen ice cream treat … so that made me start thinking of ingredients that would go well with it in place of coconut: peanuts & fudge topping; chopped up peanut butter cuts and caramel; and crushed Oreos were my favorite ideas. Oh my gosh Christy, that looks like heaven on a saucer! I think I have everything but the milk and whipped topping to make this too, if I make my own pie crust and with your one pan crust how hard is that? and whipped cream which is a breeze. My niece (who lives with me) doesn’t like coconut and my carmel topping is half full BUT I have chocolate too. So I could make one pie by this recipe and use the chocolate and just nuts on the second! Win win for me, use up the left over toppings and get too pies everyone should like all at once!! I am soo making this tonight. 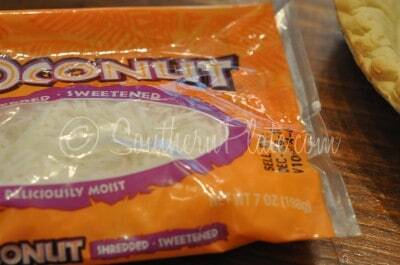 Too bad my kids don’t like coconut… soo sad they don’t like nuts… my honey and I will have to eat it all ourselves. Girl you know that sounds like my kind of pie!! Love it! I’m going to try this with chocolate topping. I made this tonight!!! Only I used butterscotch instead of caramel, because that is what the store had. I knew you would approve! LOL! This was delicious!! Wow!! So good! thanks for sharing!! Excellent idea … I’ll try that the next time I make these pies. I made this for my husband for Father’s Day. Due to diabetes in the family, we didn’t need TWO pies in the house. So, I put up an an “up for grabs” post on Facebook & gave away the second pie as a Father’s Day gift. A relative made this for our family reunion…IT IS FANTASTIC!! !